Independence Hall is a 18th century government building where both the United States Declaration of Independence and United States Constitution were signed. It is a strong anti-colonial and pro-liberty symbol. From 1775 to 1783, Independence Hall served as the principal meeting place of the Second Continental Congress, a body of representatives from each of the thirteen British North American colonies. The United States Declaration of Independence was approved there on July 4, 1776, and the Declaration was read aloud to the public in the area now known as Independence Square. This document unified the colonies in North America who declared themselves independent of the Kingdom of Great Britain and explained their justifications for doing so. The Hall was originally built between 1732 and 1753 to house the colonial government of Pennsylvania. The red brick building was designed in the Georgian style by Edmund Woolley and Andrew Hamilton, and built by Woolley. 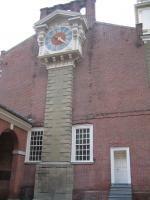 The bell tower steeple of Independence Hall was the original home of the "Liberty Bell". The original Liberty Bell, with its distinctive crack, is now on display across the street in the Liberty Bell Center. If you enter a city center by subway, it’s always a surprise what you will see when you pop your head above the ground. While Philadelphia’s subway is a story to itself, the first impression of Independence Hall isn’t too grand either. I turned my head around and saw the visitors center and blinking skyscrapers. So where’s Independence Hall? Ah, it must be that little brick building with the bell tower! These ‘tiny’ colonial buildings are completely dwarved by later constructions. Clearly no building restrictions here. There’s also a huge modern terminal to hold … one bell! Free tickets to visit Independence Hall can be picked up at the visitors center. These will include a specific time-slot, as the tours fill up quickly. My visit was scheduled for 1 pm, and I was bundled into a group with about 80 others. We first had to sit through a speech by a park ranger (a park ranger at a historic monument? Yes – this site is managed by the National Park Service). Then we went into the Hall itself. On the ground floor there are two rooms. They are filled with period furniture. One was the former court room, and the other the assembly room. This is were it all happened, the discussions among the Second Continental Congress and the signing of the documents. The area now called Independence National Historical Park has a couple more relics from the same period. Liberty Bell of course, and the pretty Library Hall. In all, it’s an important site in US and World History but it didn’t live up to my expectations. I visited the National Mall in Washington a couple of days before, and felt that Philadelphia really lacks that grand atmosphere of a (former) capital. 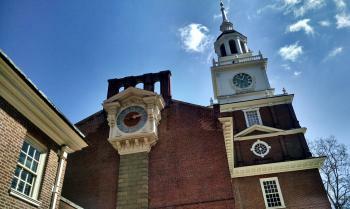 I lived in Philadelphia, PA for a decade, so Independence Hall was a building I saw frequently. I did two official tours: the first in 2007 during my first year in the city and the second was in January of this year when I went back to visit friends. The building is one of my favorites in the city. In October 2016 my friend Jeffrey and I took a coach from New York to Philadelphia for the day for the purpose of touring Independence Hall. It costs nothing to go on the tours, which are conducted by official Park Rangers from the US Parks Service. Our guide, Larry, showed us the room where the Declaration of Independence was signed in 1776, as well as the former home of the US Senate and House of Representatives (they were based in Philadelphia after moving from New York but before Washington, D.C. was ready to receive them). The concepts of freedom and democracy these men espoused (though they cared less about slavery) have since spread around much of the world and changed it largely for the better. The USA was the first democracy in modern times, standing in contrast to the monarchies that would still control most of the rest of the world decades or centuries later. Later that week I travelled to the home of Jefferson in Virginia, which, like Independence Hall, features on US currency (the nickel and the $100 bill, respectively). 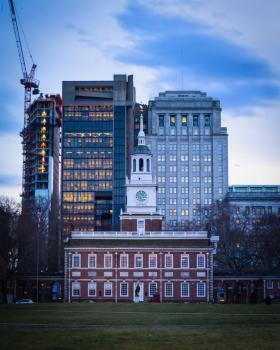 Independence Hall may seem small in stature compared to the surrounding modern city of Philadelphia, but the ideas forged within its walls far outsize the building. Over the course of twelve years, two documents were written and adopted in the hall that created a significant change in politics and governance worldwide. The Declaration of Independence, signed in 1776, was a salvo against colonial rule, and served as a model for many other colonies, particularly in the Americas, who sought independence over the next 150 years. The ideal in the preamble that "all men are created equal" and "are endowed by their Creator with certain unalienable Rights, that among these are Life, Liberty and the pursuit of happiness" is one the United States strongly believes in, even if not always living up to. Representatives met again in 1787 to draft a new Constitution--the first of its kind--establishing a new government. Key to this government was the balance of power between the executive, legislative, and judicial branches, as well as the establishment of rights and responsibilities for states within the federal government. The Constitution established the rights of the people in a democratic republic, and created a template followed by many other countries over the next two centuries. 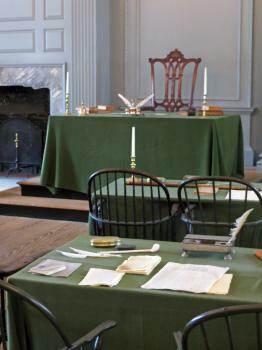 Although Independence Hall may look like just a display of colonial furniture, I would contend it is the representatives who met and argued and compromised here over two decades in the 18th century, and the two milestone documents they produced, that make Independence Hall the most important United States cultural World Heritage Site. Logistics: Independence Hall is in central Philadelphia, and may be reached by car or bus. There are many other buildings from Philadelphia's colonial past within a short walking distance from Independence Hall. I visited this WHS in December 2015. I only had a 5-6 hours layover in Philadelphia but I was determined to visit the Independence Hall and the Liberty Bell and try the famous Philly Cheesesteak Sandwich. The Independence Hall is only 15-20mins by taxi from the airport or if you're not pressed for time you can catch a train or bus (30-45mins and cheaper). It was raining quite hard all day when I visited which turned out to be quite a plus point since nobody seemed interested to peek outside the several pubs and eateries. So after visiting the Independence Hall Visitor Centre, I was told to be near the security check and Ranger in 30 minutes time to visit the Independence Hall interior. I proceeded to the Liberty Bell enclosure to see the famous crack bell (it's free!) just opposite the Independence Hall and then headed for the free tour. The tour takes roughly 30 minutes and due to the weather I was lucky to be in a very small group of 8 people. Usually there are 5-10 times as much people so it could get quite crammed. In fact on such days the tour is only limited to the first floor but we got to visit the second floor as well with the steeple, the long room, and the guns room. Most of the furniture is not original except for the highlights: the Rising Sun Armchair or George Washington's Chair, the beautiful organ and a painting illustrating the important people known as single/double/triple signers. The explanation given is very informative and the time inside is just right as there isn't really much to see. Just before you exit the building there now is a brand new UNESCO plaque so be on the lookout. If you happen to visit when there are a lot of people, you can ask one of the Rangers to let you see or take a picture of the plaque and they will kindly show it to you. The exterior is really nothing special either and I felt it this site had a more intangible OUV rather than a tangible one (if any!). If truth be told, it is a great national heritage site but I wouldn't rank it high as a WHS. The mouthwatering Philly sandwiches will surely help you make up for the average site though so go for it! Independence Hall, according to one particularly enthusiastic National Park Service employee, "The most important historical site in the United States." Logistics first, the boundaries of the inscribed property. All of Independence Square is inscribed, which includes Congress Hall, the American Philosophy Society building, and the Supreme Court Chamber. The boundary of the National Historical Park acts as the unofficial buffer zone of the property. Another important piece of logistical information is the required reservation to visit the interior of Independence Hall by guided tour. Here I must thank Michelle Tomkins who unbeknownst to her generously enriched my visit when I found her unused ticket while strolling Independence Square. The timed ticket was already well past, but during a particularly busy queue, I doubted tickets were thoroughly checked. I had researched well beforehand to reserve tickets, but they were completely reserved long in advance. 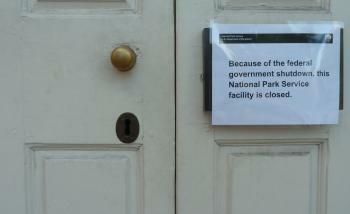 Regardless, I do not think the NPS is very strict unless its an extremely busy day. The (free) reservations are more of a crowd control method than anything, everyone is still required to pass through security. The tour lasted about 30-45 minutes, and began with an introduction by a NPS employee. This introduction and tour actually focused almost exclusively on the sites outstanding universal value, even connecting the history that occurred in this chamber with the continuing pursuit of equality for all Americans to this very day. (Lincoln, MLK, Women's Suffrage, etc.) I found this rather fitting, and quite moving how the words once spoken and written at Independence Hall spoke to the aspirations of all Americans, not just its intended original audience of white male citizens. This connection along with several well-maintained colonial structures are testament to governmental structures and universal principals that have influenced countless nations; which is reason enough for the inclusion of Independence Hall on the world heritage list. I enjoyed my visit to Philadelphia very much, indeed Trinity Church and the Carpenters Hall were also worthwhile stops within the National Historical Park. I skipped the queue for the Liberty Bell and happily viewed the bell from a nearby window that seemed to be unknown to the casual visitor. Please browse my photos on Flickr that include pictures of all interiors and exteriors of the inscribed property. It is rather hard trying to pick apart our experience of Philadelphia, it was rather tainted by the shutdown of the US government which meant that everything we wanted to see was strictly out of bounds (like most of the other things we had tried to see in the previous 2 weeks). It was particularly tough in this circumstance as the main site requires a lot of context and background information to stop it from being just a rather pleasant Georgian building. The impressive levels that the shut down had taken; blockading streets, deployment of armed guards, turning off of audio displays did make it a very unrewarding visit. Both my wife and I studied US politics to varying degrees so were fairly well versed on the values of the site. I must admit that the irony wasn't lost on us that a place preserved for the political constitution crafted there was put out of bounds by the shortcomings of that set up a couple of centuries later. There were some other fine buildings near Independence Hall and we had a nice stroll down to Mother Bethel Church which played an important role in the Underground Railroad (alas it too was closed, though this time for a community lecture series, so it wasn't as galling). Beyond this was the interesting and rather hip South Street with some long queues for famous cheese steaks. Bill Bryson said you experience a city through how you arrive in it, and I think this explains partially why my memories of Philadelphia are not the fondest. A lack of left luggage facilities at the airport saw us hauling our baggage onto a rather grim commuter train which deposited us at the grand 30th Street Station. Here we were met with humourless apathy and ambivalence by an endless array of staff inconvenienced by our presence. After a day of traipsing around closed buildings on the underinvested transport infrastructure my spirit was finally broken by the security staff at the airport that threw our belongings around and shouted at our fellow passengers. Maybe I caught everyone and thing in Philadelphia on a bad day but it isn't high on my list of places to head back to. Perhaps the interpretation inside can highlight the importance of the site and show its universal appeal; however with those parts out of bounds it is hard to give a full review and the rest of the city didn't really endear itself to me. Maybe on another day, with a functioning government and some friendlier interactions I may have liked Philadelphia but I don't think I will be rushing back to get a fuller explanation of the importance of Independence Hall. Many of the reviews are solely of the Liberty Bell and Independence Hall, which is understandable as these are the most famous monuments, and only Independence Hall is on the WHS. However, I think to have a truly exceptional experience of the colonial and Federal history of Philadelphia, one has to visit the area of Independence National Historical Park BEHIND and to the east of the landmark. Really, the whole park should be inscribed, including Christ Church, Carpenter's Hall, the First and Second Banks of the US, and the Merchant's Exchange. Honestly, those are all just as beautiful and representative examples of the early government of the US. The two banks, Merchant's Exchange, and Carpenter's Hall are undeniably beautiful architecturally and they really give you a fuller understanding of the city as a "capital." I advise visitors to delve a little deeper and not just see the bell (which is disappointing) and the Hall, which is not. On the day that millions of American elected their president celebrating their long history of democracy and the “hope” for change, I used this special day to visit the cheese steak city of Philadelphia to see the root of United States, the birthplace of this country at the famous Independence Hall. After big confusing on direction at 30th street train station, I was eventually at 5th street subway station with surprisingly no idea! At first the complex of Independence Hall Park, in my opinion, looked like a community boutique mall with many lovely parks and row of well designed buildings. The large lawn area was very well design which open vista toward the famed Independence Hall and many high-rise building nearby. After got free ticket to visit inside from the visitor center, I went to see the famous liberty bell in the next hall, apart from uninteresting exhibition and clearly visible bored ranger who always said “any INTERESTING question on the bell?” the bell was quite lovely especially its crack, and the view of Independence Hall behind the bell was just lovely for souvenir photos. Then I went inside the Independence Hall to see the room where the Declaration of Independence happened. Well I was quite surprised when the guide said all of furniture was just replica and no one know exactly what the room was liked in that time!! I finished my tour with doubt on Independence Hall, but considering that this site is inscribed solely by criteria VI, I had to agreed that the significance of Independence Hall was not the building but the history of the place and its impact on the world history as the first independence of European colony inspiring many people in both sides of Atlantic and maybe the whole world under Pax Americana, that why Independence Hall is perfect to be on 100 dollar banknote which is possibly the most wanted banknote in the world. In the spring of 1799, the city of Philadelphia, PA was bureaucrat heaven. The State, Local and Federal governments were for the most part sharing the same space, and the their constituent parts were lodged in every nook and cranny of downtown Philly. Politicians from every conceivable level were walking the streets and 18th century lobbyists were waiting behind every corner waiting to pounce. But then, almost suddenly, the city was abandoned. First the Pennsylvania government decided they needed more space and they moved to Lancaster in the middle of the summer. Then, in 1800, the Feds moved to Washington, and Philadelphia was left with only its local pols, and a pressing need with some other industry to fuel its economy. That the city did, but the few blocks around Chestnut street continued to hold the remains of what was at one time the center of the American universe. It was here at the old State House, on the first floor, that the Second Continental Congress, decided to declare themselves a thing called the United States of America in 1776. Then ten years later, the same Congress, now located in New York, endorsed the creation of a heretofore-illegal convention to replace the ramshackle constitution that had been in effect since 1781, and suggested holding it in the empty lower floor of the Pennsylvania State House. But in 1801 no one really cared all that much about historic preservation, and the place became a warehouse, then an art school, then Charles Wilson Peale’s museum, which was meant to be Philly’s answer to P. T. Barnum’s in New York. Peale’s Museum was thrown out when it was decided the building was too venerable, and became a more dignified public space, before being turned into a shrine in 1876. Today, while it’s been restored to it’s 1787 glory; one cannot help but be a bit sad that the top floor, which is where the rangers give their talks, couldn’t have been redone to be a restoration of Peale’s museum. An ancient freak show would be a perfect antidote to the solemnity of the assembly hall on the ground floor. While independence Hall itself, and Congress Hall next door, which was where the first few Congresses under the constitution met, are well done museums, much of which surrounds it is not. The shrine to the Liberty Bell is downright vulgar, and a number of private museums in the immediate area, most notably the Museum of Liberty, are total rip-offs. The National Constitution Center is hideously expensive, and when I was there, the place was full of advertisements for an exhibit that had already closed. On the other hand, the visitor’s center has a couple of nice movie theaters and a couple of decent exhibits, and the Ben Franklin and Thomas Jefferson impersonators are relatively entertaining. One thing that they’re currently doing is rebuilding the mansion that was where the Presidential residence was. When I was a kid, the site was a public toilet. I thought then as now that the President living in a toilet was hilarious. Independence Park is a UNESCO Would Heritage site, and deservedly so. The two seminal events that happened here are is why it’s essential. Independence Hall in Philadelphia is the place where the Declaration of Independence was signed the 4th of July 1776 by 56 men representing the 13 colonies. The building, built in 1732, worth a lot by the events it testifies of. Through it, we can think about events as the first independence of a european colony, the independence war following it and the establishment of the United States constitution. I have visited Philadelpia National Park and I am in awe of the entire park and what it offers. You can actually see the rooms and sites where our "Founding Fathers" met, discussed debated, quarreled and heatedly discussed the actions and documents that have given Americans the freedom we experience on a daily basis. If you are an American an want to see where our country began, schedule a visit to Philadelphia National Park. I have visited this site many times as I used to live in the area and I found the above review to be rather superficial if not a bit uninformed. For starters there are many other buildings that make up Independence Historical Park scattered over several blocks including the First and Second Banks of the United States, the Mercantile Exchange and the Tomb of the Unknown Soldier of the Revolutionary War that are given short shrift in the review. To say the site is surrounded by "blinking skyscrapers" does not do justice to its history. Before the park was created in the 1940-50's the historic buildings were completely surrounded by the modern city and some were still in use by the city government of Philadelphia. After the US government took over management of the park an entire block of 19th-century buildings was demolished (not without controversy) to create an open vista (Independence Mall), buildings were restored to their 18th-C. appearance and a wave of gentrification swept over the neighborhood so that what was once a blighted downtown area became a cohesive 18th-C. Old Town along the European model. The adjacent neighborhoods of Society Hill and Washington Square contain many beautiful streets filled with 18th and 19th-century houses, churches and other buildings not officially part of the park but which add much to the overall ambiance. (Carpenter's Hall, Newmarket stalls, Quincy St., Delancey St., Christ Church Burial Ground, Philosophical Hall, St. Peter's Church, the Quaker Meeting House to name a few). This project spurred the reclamation and restoration of Colonial and Revolutionary War era buildings all across the United States and is really a triumph of historic preservation over neglect. In that way I think this site perfectly embodies the spirit of the UNESCO list. Independence Hall and the other buildings in Independence Sq. are lovely examples of English colonial architecture. The fact that they are made of brick and "tiny" seems beside the point. The buildings were built for the colonial government of Pennsylvania and the city government of Philadelphia in the then-current Georgian style. The Federal government only occupied the buildings temporarily while the new capital was being built. They are not really the products of a national government, but of a small but thriving English provincial city. I have known several Europeans who found Philadelphia to be charming. A few even pronounced it "very European" (apparently the highest compliment they can give.) Frankly I think a visit to Independence Historical Park more worthwhile than is credited in the review. Perhaps one only gets out of a visit to a site what one is willing to put into it. 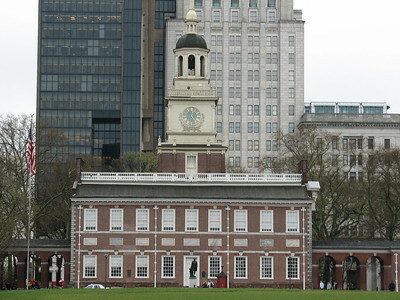 Independence Hall is located in the heart of Philadelphia. One must receive a free ticket from the visitor center a block away in order to visit the building on a short tour. Only the first floor is shown and most of the objects are replicas; however, it is still very interesting. The Liberty Bell Center and Congress Hall are near Independence Hall and should also be visited. Other than the stern security guards (security clearance is needed in order to enter all buildings), every aspect of my visit was positive. P.S. 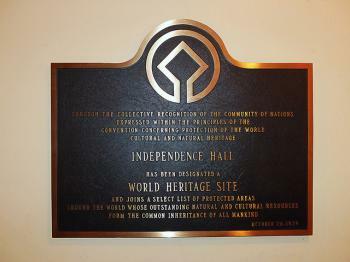 The world heritage plaque is located right outside the pre-tour meeting room so be ready with a camera if you want to have your picture taken with it as the tour will not wait for you! Philly is certainly a city with lots of character. Independence Hall is worth visiting, even when you are a child. 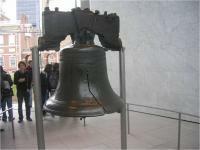 I was 7 or 8 when I went and even then I was thrilled about seeing the Liberty Bell and its big crack! No matter what a person's view of the United States' government may be, no one can deny the importance the documents and designs that originated in this building have had upon the world. The hall itself is small, but its effects have been far reaching. This is a worthy addition to the list considering the history that happened and started here. Anyone interested in US history should see the city of Philadelphia, which is the actual birthplace of this country. Many important events that led to the founding of the United States took place there when New York was still a much smaller city and Washington not even a thought in the minds of the founding fathers. Independence Hall especially is important, since in this building both the Declaration of Independence and the Constitution were signed. Because of this it is on the WH list, since the building itself is not bad but not really superlative. The whole surrounding area of downtown Philadelphia is protected as Independence National Historic Park, containing many interesting buildings and museums; most famous is the pavillion containing Liberty Bell. In general, Philadelphia is not the greatest city to visit, but its inner city does have redeeming qualities, and Independence Hall is very well worth a visit. International Exhibitions: The current bell at Independence Hall, "Centennial Bell", was made for the Centennial International Exhibition of 1876, the first official World's Fair in the United States. 340 Community Members have visited.